The problem is in the behavior. Currently, it sort of works as a toggle. 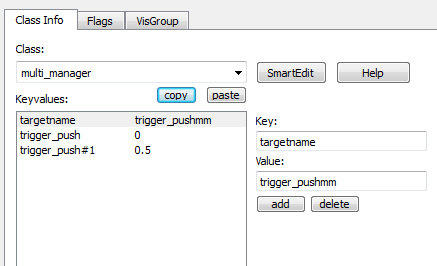 Every time trigger_multiple is touched, the trigger_push is either activated or deactivated and remains in that state until it is re-triggered and then switches the state. However, what I'm actually INTENDING to achieve (but failing to do so) is that every time trigger_multiple is touched, trigger_push is just briefly activated for a split second and then automatically deactivates again say 0.5s later, basically making it an instant short burst rather than making it stay. Any pointers as to how achieve this? Make the multisource activate a multi_manager, then just set the attributes of the multi_manager to the name of your trigger_push and adjust the delays. You don't need to add the "#1", that gets added automatically if you add the same target more than once, but it will trigger it anyways. It's working as it should now. Processed in a coincidentally hairy 279 milliseconds.